New Crochet Cable Boot Cuff Pattern! A few days ago I sent out issue #65 of my Crochet Inspirations newsletter: “Mock Cables in Slip Stitch Crochet.” I’m getting questions from readers about the dark brown crochet cable boot cuff photo (shown below). I crocheted that one in November 2012. The gray striped one is fresh off the hook. The 2012 brown one is actually a prototype of the new crochet slip stitch Lucky Twist Mitts. It’s my newest downloadable pattern. A matching Lucky Twist crochet cable boot cuff pattern is almost finished. Update: The boot cuff pattern is done! The early brown Lucky Twist swatch helped me test lots of things. For example, how stretchy the limp five-ply merino yarn would be as a mitt (not enough). How much to taper the ribbed edge with short rows. I wondered about the speckled dyeing and overall dark brown tones. As I mentioned in the newsletter, I had to dramatically brighten these photos just so that the cabled stitch textures would show up! So in real life I’d need to be standing in full sunshine to see the cabled surface texture in a dark brown yarn. The short amber color flecks are pretty, but they distract a bit from the cables. Finished dimensions for a good crochet cable boot cuff pattern. Folded, unfolded, scrunched. All ways are fun! 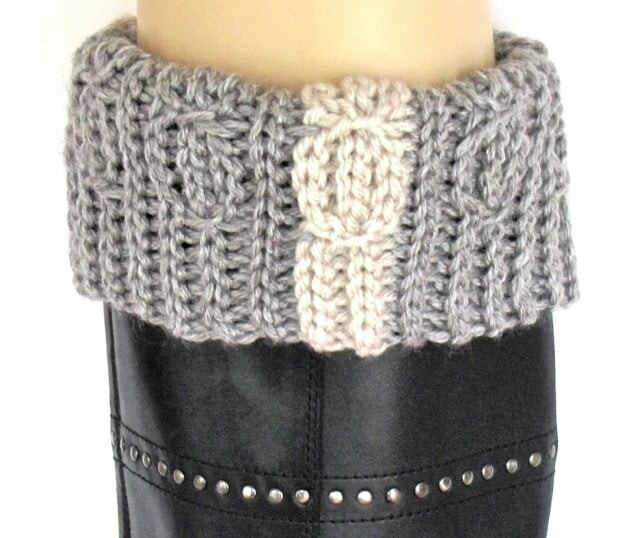 Back in 2012, crochet boot cuffs were such a new trend that they might have just been a one-season fad. That November I traveled to northern Illinois to teach a crochet retreat. It was a boot-wearing opportunity that I don’t often get here in Florida. It was in Illinois that I started the brown crochet cable boot cuff pattern prototype. I’d be able to test how much warmth they add, and if I enjoy wearing them. I discovered that crochet boot cuffs feel great! I wore them over dark tights with skirts. They stayed put. I enjoyed wearing them all ways – scrunched, folded over the boot, and unfolded. Down low into the boot or up near the knee. I did find that I wanted longer ones that covered more of my legs for warmth. So, are boot cuffs basically a revamping of leg warmers? I’ve seen patterns all over, but never really understood why so many people would want a knitted or crocheted “topper” on their boots. They’re like leg warmers if they’re made long enough. I think boot cuffs are inspired more by thick boot socks, but without the bulk of the sock part. Like boot socks, boot cuffs fill in the gap between the boot tops and legs. So they do warm the legs to some degree, like both boot socks and leg warmers do. Now, see, that makes more sense. Thanks for clarifying!! Thanks for asking. You have inspired the next newsletter issue!